Morning Star Warns of “subterranean” communications between “elements” in Labour and “EU powers that be”. Morning Star Warns of “subterranean” pro-EU Labour. On Thursday the Morning Star carried this Editorial. The danger is clear. Every suggestion, explicit or subliminal, that exit from the EU is an option that can be deferred, either for now or infinitely, threatens Labour’s hard-won credibility with its core electorate of working people. The serial undermining of Jeremy Corbyn’s pledge to respect the referendum result has many seats of subversion. Some can be found in the shadow cabinet, even among those charged with implementing conference policy. Some on the back benches where unfulfilled ambition ends in speculation about forming a new centre party of class collaboration or reconstituting a Blairite tendency to the same ends. There are many subterranean channels of communication between elements in Labour and the EU powers that be. It needs to see beyond a full Brexit on March 29 to the next stage in the struggle for a people’s government. Labour should support the “full Brexit” first, of course. Last night Channel Four carried a report by Michael Crick with David Aaronovitch on the Four Ms, Corbyn’s key advisers. These are, Corbyn’s strategy and communications director Seumas Milne, his chief of staff Karie Murphy, her friend Len McCluskey, general secretary of the Unite union, and Andrew Murray, adviser to Mr Corbyn and chief of staff to Mr McCluskey. Crick referred to the background of Milne and Murray in the 1980s Communist Party of Great Britain faction, Straight Left. 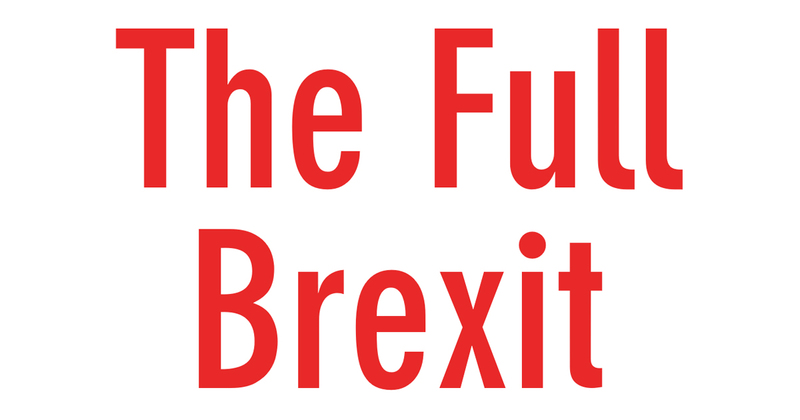 Both Channel Four and the article concentrated on the pro-Brexit, the “full Brexit”, politics of the four, described by the former CPGB student activist (with a sad family background in the CP, as he has written about in Party Animals 2015)) as “a veritable Cerberus”. The Times journalist made, the accurate, observation that these, and others, remained stuck in the mid-70s ‘Broad Left’ (from Michael Foot, Tony Benn, to the old Communist Party of Great Britain and much of the Trotskyist left) opposition to ‘Common Market’ and all of its works. The Times piece also contained paragraphs on Andrew Murray’s views on the Ukraine and the way he blamed the ‘EU’ for intervening against Russian President Putin’s plans to destabilise the independent country. Over 150 people attended the meeting to hear Richard Brenner (Solidarity with the Antifascist Resistance in Ukraine), Lindsey German (Counterfire), Boris Kagarlitsky (Institute for globalization studies and social movements), Andrew Murray (Communist Party of Britain), Alan Woods (International Marxist Tendency) and Sergei Kirichuk (Borotba) discuss the threat of fascism in Ukraine, the role of imperialism in the current situation and the need for a campaign in support of the antifascist resistance in Ukraine to provide a counterweight to the lies and distortions of the Western media. Andrew Murray explained that “fascism is as fascism does” and that the recent attacks by fascist thugs, such as the brutal murder of protesters in Odessa, show that we are talking about real fascism, not just the equivalent of UKIP in Britain. He also warned against prettifying the intervention of the EU as if “over there” it is a good thing whilst “over here” it is not. He also stressed that the Left should be united and put pressure on the British government to cease its support of fascism in Ukraine. Having the past brought up sent the Morning Star into a rage. For Aaronovitch the aim is, as he states without equivocation, to win over Corbyn or “to neutralise” Corbyn. So again the target is not the praetorian guard but Corbyn himself. Nick Wright is proud enough of his scattered broadside to put it on his blog. Nick Wright was also a member of Straight Left. The ghosts of the 1970s left, with its backing for the Alternative Economic Strategy, put into place outside the ‘Common Market’, complete with import controls – no doubt still a popular demand – continue to haunt many minds. The Lexit Left demanding the “full Brexit now” has some influence outside of the Corbyn inner circle. There are no doubt those who take the views of those supportive of Tony Blair (at the time) who now wish to see the UK remain in Europe to promote their vision of “stakeholder capitalism” (Saving Britain by Will Hutton and Andrew Adonis. 2018). The case against Leaving is never more valid than now, when the details of the dire economic and social effects of Brexit emerge every day. But warmed up ideas for stakeholding and “transforming our economy”, policies that included worker and wider social participation in a reform of how companies operate , that were not implemented under either Blair now Brown, lack credibility. As Aaronovitch said, the mainstream left, in Labour and the Unions, moved to a more supportive position on the EU during the 1980s, when Jacques Delors began as president of the European Commission (1985 – 1995) for more pragmatic reasons. European labour and social legislation are seen as a bedrock for people’s rights. Much of the radical left these days is behind Another Europe is Possible, from the centre-left Open Labour, the democratic socialist Chartist, Marxist groups, like Socialist Resistance and the Alliance for Workers’ Liberty, the Left Unity party, Greens, and many people of no direct affiliation. « A critique of Jacques Rancière’s Politics. The Morning Star poses as a more or less uncritical Jeremy Corbyn fanzine but in fact supports the one policy that JC has clearly ruled out: a no-deal Brexit. So how the hell do the Stalinists square the circle of supporting the very policy (no deal and WTO rules) that their hero Jeremy explicitly opposes? Should be ‘The Full *English* Brexit’, shouldn’t it? Andrew, two things. Firstly, the Morning Star is not run by the Communist Party but by a management committee elected at the agm of the Co-operative that owns the title and which has by rule representatives of the trade unions that hold shares on it. You can buy shares yourselves and even run for membership of the committee. The paper’s policy is to provide a platform for a wide range of views and even carries contributions by your very own Jim Denham. Secondly, far from Aaronovitch and I being old chums I cannot recollect ever meeting the bloke. Thinking about you did or does own The Morning Star I did a company check as well as a Charity Commission check and there is is no record of the People’s Press Printing Society at either. It seems that just after WW2 the CP handed it over to the PPPS but retained an interest through the Daily Worker Cooperative Society which went into liquidation at an unspecified date of which there is no record as is there no record of DWCS as either a company or charity so the whole thing is a bit of a mystery. I never read the thing as it has always been the most dire and boring load of old hogwash but if someone could tell who the publishers are I’ll do a bit of tracking that way. On the subject does anyone have any information about the Ken Livingstone advisor Kumar Murshid who tried a Livingstone backed coup about twenty years ago when Murshid packed the membership with Bangladeshis and tried to seize control. The coup failed but it’s indicative of the deviousness and dishonestly of Livingstone that he would try something like this and go to the extent of financing it. I was a member of a T & G Branch which had these “shares. We never heard a dicky bird about elections or meetings of the this ‘co-op’ – that was over a ten year period.